The Ocean Victory semisub discovered the LLOG OCS-G-27277 well in December 2007. The discovery well found more than 380 feet (116 meters) of gas and oil pay zones in four separate reservoir packages. The field was further appraised by two wells testing additional targets in 2010. Once appraisal operations were completed, Who Dat was deemed commercially viable. The operator stated Who Dat is primarily an oil field consisting of nine stacked, amplitude-supported reservoirs in a salt withdrawal mini-basin. The wells targeted reservoirs ranging in depth from 12,000 to 17,000 TVD. Collectively, the three wells penetrated more than 700 feet (213 meters) of net pay in nine distinct reservoirs. 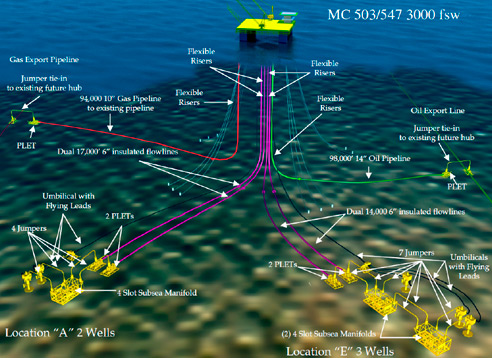 The development plan for Who Dat consists of completing three existing subsea wells, drilling an additional two wells and producing the wells through a subsea system capable of handling up to 12 wells. The wells should flow through three subsea manifolds to the OPTI-EX FPS through flexible risers. The OPTI-EX FPS, delivered to LLOG in July 2011, is capable of producing up to 60,000 bopd, 150 MMcf/d and 40,000 bwpd. Production from the Who Dat field is scheduled to commence in mid-2011. Posted on November 2, 2011, in Semi-submersible, Subsea, Well Intervention, Who Dat and tagged energy, FMC Technologies, gulf of mexico, Offshore Projects, Oil and Gas, subsea wells, Well Intervention, Who Dat. Bookmark the permalink. Comments Off on Who Dat.